I really love salmon, it’s definitely one of my favourite things to eat, so it’s pretty surprising that I’ve never tried a salmon cake. I’ve always just been a fan of the classic, baked salmon. The one that melts in your mouth, and is flavored with whatever your mind can imagine. However, I get bored easily, so I’m always trying to find new ways to eat my favourite things. I was watching The Food Network one morning, and on the show I was watching they were making salmon cakes, they looked so easy, affordable and tasty. Something that could be flavored however you wanted, maybe I would make some spicy salmon cakes packed with hot sauce and hot peppers and chili powder, or I would make savory salmon cakes with bacon and cheese, or maybe I would go with these salmon cakes, a more basic and perfect way to get into salmon cakes. I’ve created a flavor combination that just works, the capers and Dijon add a nice, salty and tangy addition to the sweet and healthy sweet potato, the hot sauce adds a little bit of a kick and the panko creates a nice crunchy crust without frying. 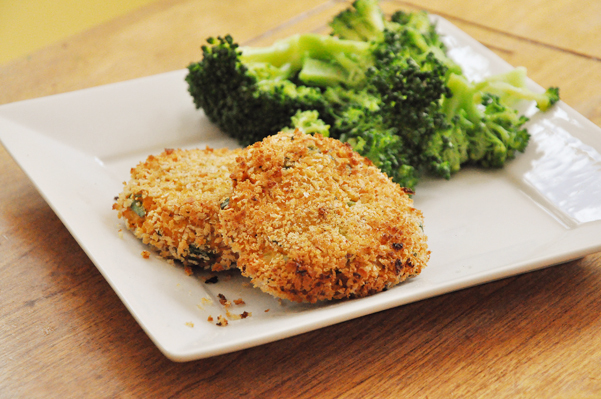 These are healthy, easy and delicious, perfect for a weeknight meal. Bring a pot of water to a boil and cook sweet potato until just fork tender, about 15 minutes. Remove from water and mash. Meanwhile, combine mashed sweet potatoes with green onion, lemon zest, parsley, mayonnaise, Dijon mustard, capers, egg, and 1/4 cup panko and canned salmon in a large bowl. Form the mixture into 8 patties using your hands, then press patties in the remaining 3/4 cup of panko. Place patties on a greased baking sheet. Spray one side of the patties with cooking spray. Bake for 5-7 minutes in the oven. Carefully flip patties over and cook for another 5 minutes. For a crisper crust, turn on the broiler and broil patties for 2 minutes. I hope you enjoy these salmon cakes, they are one of my favourite things right now, I served mine with lots of hot sauce and some Spicy Broccoli. My hubby loves anything coming from the sea...( got me thinking I was probably a mermaid in my past life, since he loves me more than he loves seafoods! LOL! )This salmon treat will make my husband smile...I'm sure!